People have been asking me if I'm still dieting or on a diet. The definition of diet that I've been using is different than what everyone is asking me. The most well-known definition of diet is eating food to lose or control weight as well as nutrient intake. My definition of diet is the sum of the food consumed or the food I eat on a daily basis. 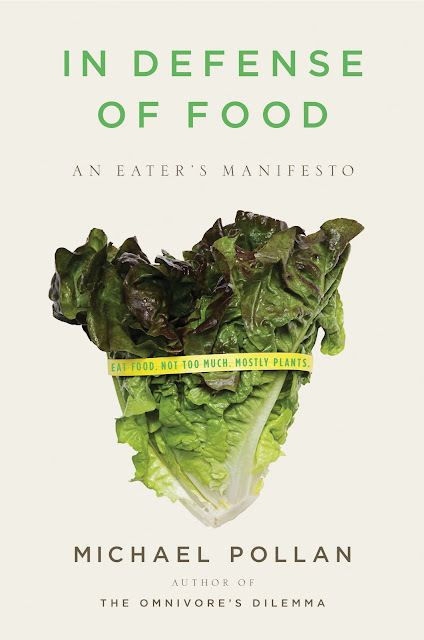 Look at the ribbon on that head of lettuce: "Eat Food. Not Too Much. Mostly Plants." It's that simple. Now I don't always succeed at that but I'm at least aware of it at all times. Having fruits and vegetables be the focal point on my plate and the meat (especially red meat) be the side item has helped a lot. It's very "un-American." I've run into people on my journey who aren't willing to make that type of change and it's easy to see where it's getting them. It's not like you have to give up all of the bad stuff. When it comes to red meat, I still eat it but not as often and I enjoy it more. I'm a huge fan of hamburgers, both homemade and at restaurants. Whereas I would have 2 homemade burgers with cheese, mayo, ketchup, etc., now I have 2 burgers in the course of a month, probably more like 2 or 3 and it would consist of mustard and maybe pickle. If it's steak, I would limit myself to 4 or 5 oz. and not a typical dinner-sized portion. I've made drastic changes in what I eat and how much. I'm not perfect but I'm more aware of what I'm doing and not just mindlessly eating. Also, check out that book referenced above as well as his more well-known book The Omnivore's Dilemma. After that, pick up Food Rules. I'm on board with this as well. after trying to be vegetarian for about a year I missed cheeseburgers too much ... but I only missed really good cheeseburgers. since then I've more or less saved meat for special occasions once or twice a week. if your not eating meat 14x a week -- you can also avoid all the (processed with who knows what chemicals) cheap stuff and splurge on something organic and hopefully local.